Filmed before a live audience in London in 1968, The Rolling Stones Rock and Roll Circus was originally conceived as a BBC-TV special. Directed by Michael Lindsay-Hogg, it centers on the original line up of The Rolling Stones -- Mick Jagger, Keith Richards, Brian Jones, Charlie Watts, Bill Wyman (with Nicky Hopkins and Rocky Dijon) -- who serve as both the show’s hosts and featured attraction. For the first time in front of an audience, “The World’s Greatest Rock and Roll Band” performs six Stones classics. The program also includes extraordinary performances by The Who, Jethro Tull, Taj Mahal, Marianne Faithfull, Yoko Ono, and The Dirty Mac. A ‘supergroup’ before the term had even been coined, the band was comprised of Eric Clapton (lead guitar), Keith Richards (bass), Mitch Mitchell of The Jimi Hendrix Experience (drums) and John Lennon on guitar and vocals. 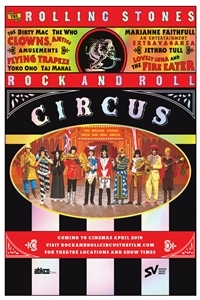 The Rolling Stones Rock and Roll Circus is the first concert film to be mixed using Dolby Atmos Technology and Dolby Vision. ABKCO Films has produced a breathtaking experience that faithfully re-creates the actual environment in which this historic event took place using invocative technology that treats sound as 3D spatial information. It can be said that what Dolby Atmos does for sound, Dolby Vision does for visuals. Dolby Vision is an advanced HDR technology that delivers enhanced contrast, detail and dimensionality to the screen by empowering every pixel with a much broader range of color and brightness.